Whether you call it the Wadden Sea in English, the Wattenmeer in German, or the Waddenzee in Dutch, it doesn’t change the fact that this UNESCO site in Germany has seaside resorts, is a protected ecosystem, and has hiking expeditions. You’ll find the Wadden Sea, which also includes the Wadden Sea National Park, in the North Sea. Though, it does not encompass the entire North Sea — essentially, the coastline in northern Germany, the Netherlands, and Denmark. One part of the Wattenmeer is North Frisia. And one of its poshest seaside resorts (& island) up there is Sylt. Be prepared, have your cam ready, the next celebrity stands right next to you. Big cities are found on (or near) the Wadden Sea too, like Hamburg, which is part of the Hamburg Wadden Sea National Park. 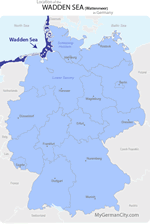 The Lower Saxony portion of the Wadden Sea National Park includes the East Frisan Islands, like Wangerooge. Located just six kilometers from this tea drinking island is the Roter Sand Lighthouse. Oh, it ain’t easy to get here — but, for the right price (including having to bring your own water and food) you can spend the night tens of meters above the sea. Still in East Frisia you’ll find one of its biggest seaside resort towns (& island) there, Borkum, where you can take a number of ferries around to some other places of the Wadden Sea. With any luck you’ll get a glimpse of the grey whales. It might be hard, since they were once hunted to the point of extinction, but, thankfully, some are making a comeback. Whales aren’t the Wadden Sea’s only residents. Dolphins and seals are some of its other mammal residents, which isn’t many. They’re totally outnumbered by fishes and other aquatic creatures that include mussels, crab, oysters, clams, sturgeon (what a sea-lovers feast that is), as well as stingrays and jellyfish. Birds love the Wadden Sea, too. The salty marshes and reeds are where ducks, geese, and some other 60 species of birds come to breed or rest on the wetlands (they just love munching on the insects and spiders that live here). Yuck, bugs. Birdwatching is a huge activity here, but so is mudflat hiking. When the tide goes out, the mudflats are a great place to just walk out over the land that was just covered by water. One tip: If you’re not familiar with the tide schedule, grab a guide. Because you don’t want to get caught out there when the tide rolls back in. Further out into the Wadden Sea the water is subjected to some pretty strong currents, but that doesn’t stop anyone from coming out here boating. Just a little caution is necessary, that’s all.